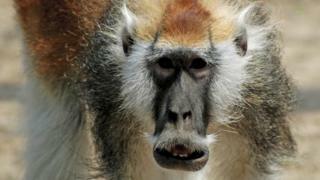 A monkey from Ethiopia and Sudan with a "handlebar moustache" has been identified as a distinct species. It was originally described as a separate species in 1862, but was later folded in - incorrectly - with other patas monkeys to form a single species. Details have been published in the journal Primate Conservation. Patas monkeys are found from west to east across sub-Saharan Africa; they are among the fastest-moving of ground-dwelling monkeys - able to reach speeds of about 55 km/h (34 mph). Spartaco Gippoliti, from the IUCN SSC Primate Specialist Group, reassessed the species status of patas monkeys in the Blue Nile region of Ethiopia and Sudan. His analysis led him to revive the classification of the Blue Nile patas monkey (Erythrocebus poliophaeus) first proposed more than 150 years ago. That designation was dropped in 1927, when the German zoologist Ernst Schwarz rearranged the primate group's taxonomy and decided there was just one species. The newly recognised, bewhiskered primate lives in the Blue Nile basin in western Ethiopia and neighbouring Sudan, and geographically separated from other patas monkeys by Sudan's Sudd swampy region and the Ethiopian highlands. Their faces and noses are black and they lack the characteristic band between the ear and eye found on other patas monkeys. Mr Gippoliti commented: "The basic concept of the genus Erythrocebus was unchanged for about 100 years now, and the discovery of a distinct species living in eastern Sudan and western Ethiopia will put in the spotlight a little-known region of Africa, offering opportunities for new conservation projects in the area." Anthony Rylands, from the conservation group Global Wildlife Conservation, commented: "There is notable variation in these remarkable primates. It's only through this kind of painstaking research that we get a proper handle on their diversity so that we can more effectively protect these species from the threats they face." Several other discoveries are described in the same issue of Primate Conservation, including a new dwarf lemur in Madagascar, two new tarsiers in Indonesia, and two new sub-species of slender loris in Sri Lanka.